Side Sleepers, do you find that you sleep in the fetus position, log position, or the yearner position? According to the Better Sleep Council, read what your sleeping position says about you! Fetus Position - The most common option, this slightly curled up position typically corresponds with people who "have a tough exterior but are still sensitive and may appear to be shy but warm up quickly." Log Position - Sleeping on your side with both arms down suggests "you are a social, easy-going person who is trusting, sometimes to the point of being gullible." Yearner Position - Side sleepers who rest their arms outward tend to be "open-minded and still cynical, suspicious, and stubborn about sticking to decisions once they are made." For Back or Stomach Sleepers, we tend to see the freefall position, the soldier position, or the starfish position - do any of these describe you? Soldier Position - Resting on your back with you arms at your side may indicate that you are "reserved, quiet, without fuss, and hold [youself] and others to a high standard. Soldier sleepers have a higher likelihood for snoring due to the flat-back position, which may not cause them to wake up often but may result in a less restful night's sleep." Freefall Position - Those who are stomach sleepers are found to be "brash, outgoing, and are very uncomfortable with criticism." Starfish Position - Sleeping on your back with your arms up over your head can show that people are "good listeners, helpful, and are uncomfortable being the center of attention. People who sleep in starfish position are more likely to snore and to suffer from a poor night's sleep more often." So what do the professionals recommend? Sleeping on your side can help to alleviate the chance for pain throughout your body during sleep. It's also the best option for those with back pain and pregnant women. No matter what position you sleep in, there's a pillow to suit your needs! Bedgear is a leading manufacturer of performance bedding essentials with a philosophy centered on delivering superior sleep quality to enhance your active lifestyle. 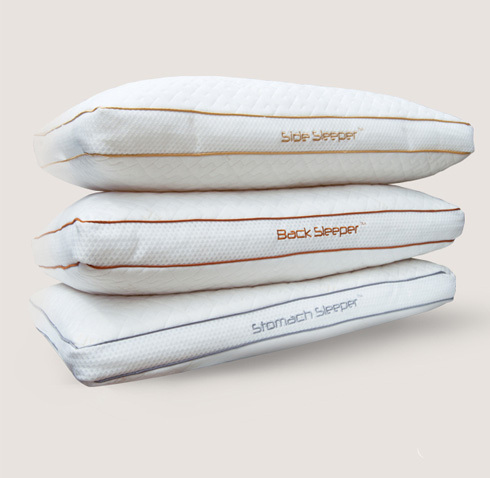 Their Align Pillows are specified for back, side, or stomach sleepers. If you feel that you toss and turn or sleep in various positions throughout the night, the Balance Pillow is the right choice for you!